Parc National du Mont Tremblant in Quebec. After a week in Montreal, it's time to hit the road again. By now the fall colours are well on their way so we head into the nature parks which basically back onto the cities of Montreal and Quebec. Once we found our way out of the city (after a spot of shopping), we headed straight for the resort village of Tremblant on the slopes of Mont Tremblant. During the winter months, the village bustles with activity as urbanites swarm to ski the slopes of the mountain. It is only about an hour and a half from the city of Montreal and very accessible. Today however, the village looked a little sleepy, with dinghies bobbing gently on the lake and the stirrings of fall evident on the surrounding trees. 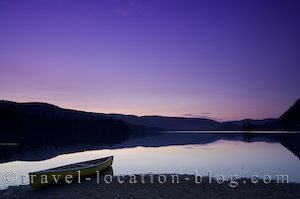 We continued our journey into the Parc national du Mont Tremblant, the nearby provincial park, and decided to set up camp on the banks of Lac Monroe. It was so peaceful after being in the city, and there was only a few other camper's at the site. We decided that here was a great place to get the canoe wet again, so began the task of taking it down from the camper. After watching the sun set on the already fiery coloured trees, we headed out to the middle of the lake for a night paddle.